This is an amazing early piece by John Byrne. It is from HULK ANNUAL 7. 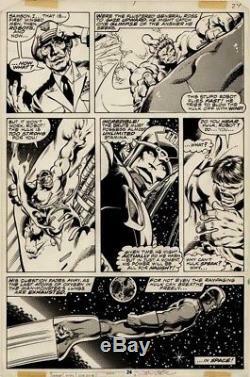 Bob Layton did the inks. Considering you are pay 20k plus for some of his x-men work this is a great alternative. The item "John Byrne of Xmen fame comic art! This is from the hulk annual number 7" is in sale since Friday, July 27, 2018. This item is in the category "Collectibles\Comics\Original Comic Art\Other Original Comic Art". The seller is "gavin2344" and is located in Scranton, Pennsylvania. This item can be shipped to United States.